I am barely keeping it together as I type this, you guys. 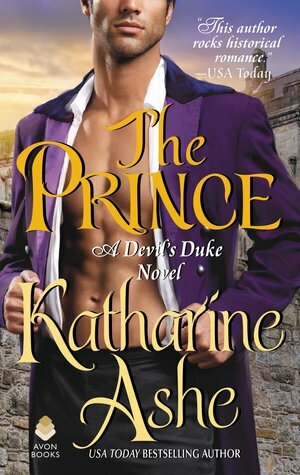 I read my review copy of The Prince some time ago and have literally been counting down the days until I could reasonably share my thoughts with you. Because I want to shout my love for this book from the rooftops, I love it that much. And, yes, before we go any further, we should go ahead and acknowledge that this is more man-chest than has ever been seen before in these parts. I mean, wow is that lot. But the information relevant to your interests is that this book is so good, it transcends any possible cover the Cover Gods could see fit to bestow. I do, occasionally wish that Choose Your Own Covers were an option, because I've been feeling positively agitated at the thought that there might be someone out there who doesn't pick up this book because something about its trappings throws them off. Hence, today's review. I discovered Katharine Ashe a couple of years ago via her very enjoyable Falcon Club series. Those books segued nicely into her Devil's Duke books, of which this is the fourth volume. Libby Shaw will have none of it. She is through trying to stuff herself and her ambitions into the tiny box society has set out for her and, come hell or high water, she is going to medical school to become a surgeon. She isn't about to let anything so trivial as gender stop her. And so it's pasted on beards and trousers and taking herself off to Ediburgh to fool them all. Which is where the reclusive portrait artist known as The Turk comes in. He once strove to delineate Libby and was frustrated at never being able to quite get her lips right. When the two meet once again in Edinburgh, he recognizes her for who she really is. In an effort to stop him from exposing her, Libby proposes a deal of sorts. He will allow her to board in one of the empty rooms in his town home and, in exchange, she will sit for him once a week for one hour only. Against his better judgement, the deal is struck. And thus begins the most beautiful of partnerships, though neither party is fully aware of the gravity of their relationship. Because Libby is far from the only one keeping secrets. And it is perhaps his secret that will prove the most impossible to overcome in the end. I know that Muslims believe in the same god as Christians, although they call that god by a different name. When the American Thomas Jefferson insisted on that, many people made a fuss about it, but I think it makes perfect sense. And I know that idols are prohibited you. Admittedly I don't know anything about harems . . . and such. But I don't understand how anybody schooled in Scripture could think a child would be a useful religious sacrifice, for of course Abraham, who was the father of Judaism, Christianity and Islam, made that mistake with his own son so that the rest of us needn't ever after. In general I am not taken to fanciful notions, for I read a lot—a lot more, that is, than the caricatures of Byron or Morier. And I don't depend on the ridiculous portraits of foreigners one sees at the opera to inform me. I regret that is not the case with every Englishman or Scot you have encountered. If I could slap them all, I would." For a long moment he did not speak. "You would slap them," he finally said. "Yes. For I don't have a collection of daggers. Although I do have surgical instruments, it's true. So I suppose I could inflict some fairly grievous wounds if necessary. I haven't yet taken an oath as medical men do, so it would not be strictly unethical, although certainly immoral. But I would do it for your sake. Please let me know if you ever wish me to." His beautiful eyes changed—as though he not only believed her words but understood her. This is an incomparable romance. It is incomparable historical fiction. And it is wordsmithing of the finest kind. There. How's that for setting the bar just a little high? But I am convinced there is simply no amount of praise I could lavish upon The Prince that could be even remotely considered overdoing it. It is not only a highlight of my reading year thus far, but of my entire history of reading in the genre. It should be taught in historical writing classes, as far as I'm concerned. One of the primary reasons is it is such a fine example of purposely crafted, elegant storytelling. Libby and Ziyaeddin are so whole. And by that, I mean not only are they fiercely vibrant characters, they are presented from every possible facet. Not one whit of emotional depth or intellectual complexity is overlooked. And while I always wished for them to be together no matter what page I was on, I never felt lonely or off balance when they were not, no matter which of them I was with at any given time. Which brings me to their verbal interactions. The dialogue in this novel, the sheer, joyful, unadulterated, endlessly witty banter. It is off the charts stellar. In fact, "banter" seems too small a word for the effortlessness of what passes between them. I tell you, my actual person felt physically incapable of holding the delight it brought. To say nothing of their ongoing internal dialogue and the way they quietly admire each other. Libby rarely, if ever, stops talking. And Ziyaeddin would happily stay silent for days on end. Libby lives with what would now likely be termed Asperger's. And Ziyaeddin uses a cane to walk in the absence of the limb he lost in an incident he will speak of to no one. Both of them use assumed names and are used to feeling (and often being) unknown, even to those who might be expected to know them best. All of which combines to make the most beautiful backdrop for the development of an unrivaled companionship. Heart tight, she turned to the stairs and went up as swiftly as her bandy legs would carry her. When she paused on the landing and looked down, he stood there still, watching her. "My father and I have always lived wherever his patients wished. I have rarely stayed in one house for long. I have never had a home that could be mine forever." He nodded, and it was so regal that she wondered she had ever thought him anything but a prince. "I won't bother you," she said. "I have very little confidence in the predictive value of that statement." Air shot out from between her lips. "Was that noise an agreement?" he said, a beautiful smile shaping his mouth. She laughed again, and pain shot through her lungs. "I missed that sound," he said. "Your laughter." She clutched the linen over her chest. "It hurts." "Yes," he said. She didn't mean the laughter hurt, but she thought perhaps he understood that. "I will try not to disturb you," she said. "Don't," he said. "Disturb me. Every day. Every hour. Every minute if you wish." You know that feeling, when you're just so massively grateful that a certain book was written? That it came into existence at a time when you happened to be living? That is how I feel right now. I look forward to pressing it into many hands, knowing that disappointment won't ever even be on the table. Because beauty and humanity are what this novel does. They are what makes up the fabric of its soul. Reading it is a joyous experience. One I shall always treasure. The Prince is out today!